This is our review of Hotspot Shield Elite VPN, based on real VPN testing results. In this review, we will cover Hotspot Shield Elite VPN’s speed, reliability, price, free trial, software, customer service etc. Website blocked in China (service not blocked). Free Trial: 30 day money-back guarantee. Hotspot Shield is a very popular VPN service provided by AnchorFree, a Internet security company based in California, USA. It has two types of VPN services: a free version and a paid version called Hotspot Shield Elite VPN. This VPN review will focus on Hotspot Shield’s Elite VPN. Elite users do not see sponsored ads, can use Virtual Locations to switch countries to access, and can have unlimited usage and access to content (Free users have certain limits). On top of that, Elite users get Elite-only server pools to make the connection faster and content unblocking more reliable. Currently Hotspot Shield’s website is blocked in China. Visitors from China might have to access its website using another VPN or proxy service. However, once you have signed up for a Hotspot Shield Elite VPN account and installed its VPN software, you can use its VPN services from China directly without using other VPN or proxy services. Hotspot Shield Elite VPN uses its proprietary VPN protocol and connection algorithms, along with a high level of obfuscation, to make VPN blocking harder. This is a good feature for users in China, where VPN connections often get blocked or interrupted. Server Locations: Hotspot Shield Elite VPN has servers in 22 countries, including US, UK, Canada, Japan and Hong Kong etc. It’s interesting that one of its server locations is China. While its China location might not be a good choice for unblocking websites from China, it can be used for the purpose of VPN into China – getting a China IP address when you are not in China. VPN protocols: Hotspot Shield Elite VPN uses its own proprietary VPN protocol, which is “faster and more secure and harder to get blocked by censorships”. It also supports OpenVPN and IPSec as backups. Simultaneous Connections (Multi-logins): Hotspot Shield Elite VPN allows up to 5 devices to be connected at the same time. Logging: Hotspot Shield Elite VPN does not keep user logs, which is a good feature if privacy is one of your top concerns. Platform Support: Hotspot Shield Elite VPN supports Windows, Mac, iOS and Android. Hotspot Shield VPN has a free version with limited features and displays some ads. For its paid version, called Hotspot Shield Elite VPN, the price starts from $2.08/month (if you pay for two years). Its 1 year plan costs $29.95. The 6 month plan costs $19.99 and its monthly plan costs $11.95/month. 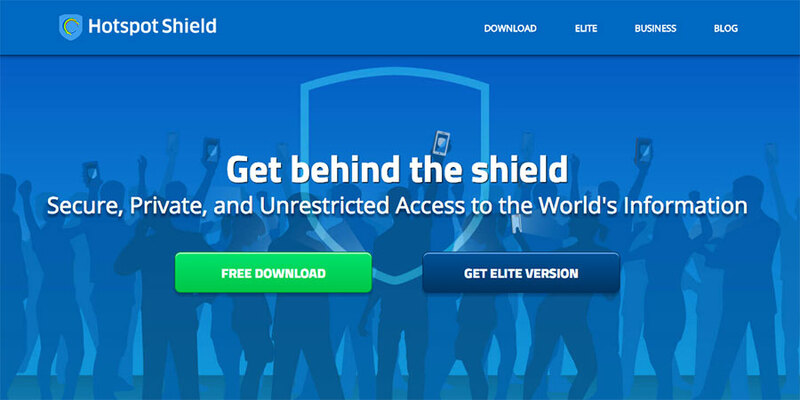 Hotspot Shield Elite VPN offers software for Windows and Mac. In addition, it has apps for iOS and Android, available from Google Play and the Apple App store. 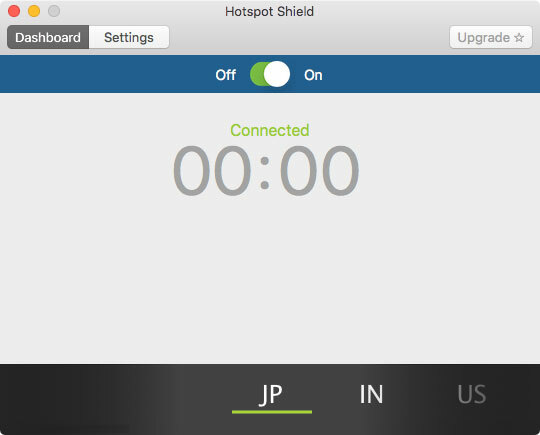 We downloaded Hotspot Shield Elite VPN’s desktop client for Mac OS. The installation process was straight-forward and the software interface is clean and intuitive. With the desktop software, you can connect/disconnect to VPN and also change server locations. Then we used Hotspot Shield Elite VPN’s Mac desktop client to connect to its Japan server. We got a download speed of 37.54Mb/s, which is quite fast. We have also tried connecting to Hotspot Shield Elite VPN’s other server locations. Its Hong Kong server also offers very fast speed. However, we have run into some occasional connection problems (connection time-out) for some servers. Currently Hotspot Shield Elite VPN doesn’t offer live customer support. To get support, you can use their online form to leave a message. Hotspot Shield is best-known for its free VPN service. Its paid VPN service, called Hotspot Shield Elite VPN, does work well in China. Although Hotspot Shield’s main website is blocked in China, its Elite VPN service is not blocked (but you might run into occasional connection problems some times). If you are looking for a VPN service, you can give Hotspot Shield Elite VPN a try. If you are looking for a good VPN services to be used in China, Please make sure to read our list of Best VPNs for China Internet Users . This entry was posted in VPN Reviews and tagged hotspot shield vpn, review. Bookmark the permalink.